Point Pleasant senior Jacob Bryant (14) tries to clear the ball out of Cabell Midland’s offensive zone during the second half of Wednesday night’s boys soccer match in Point Pleasant, W.Va. 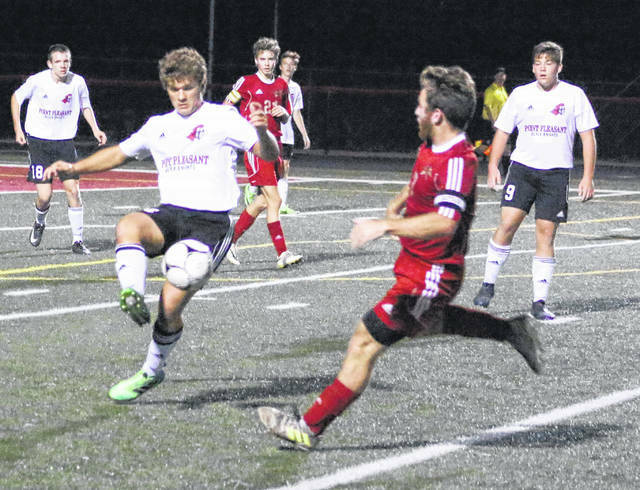 Visiting Cabell Midland scored two goals in the opening five minutes of regulation and never looked back Wednesday night during a 3-0 victory over the Point Pleasant boys soccer team in the hosts’ regular season finale at Ohio Valley Bank Track and Field in Mason County. The Black Knights (9-10-1) just never found any kind of rhythm — offensively or defensively — as the visiting Knights (9-6-1) put together a pair of goals on their first two shots of the game, which all but ended any kind of early energy level from the hosts. 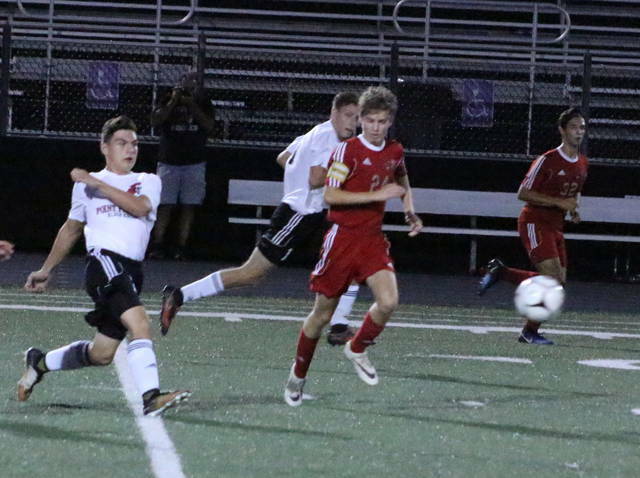 Point Pleasant managed the first shot of the game, but CMHS followed with a shot of its own in the fourth minute as Hayden Cooper fired a free ball toward the net. A Point defender had the ball ricochet off of his head and into the back of the net, with the own goal giving the guests a permanent lead at 1-0. A mere 47 seconds later, Cabell Midland increased its lead as Omar Baryun buried a long-range shot in front of the net for a 2-0 cushion at the 34:56 mark of the opening half. 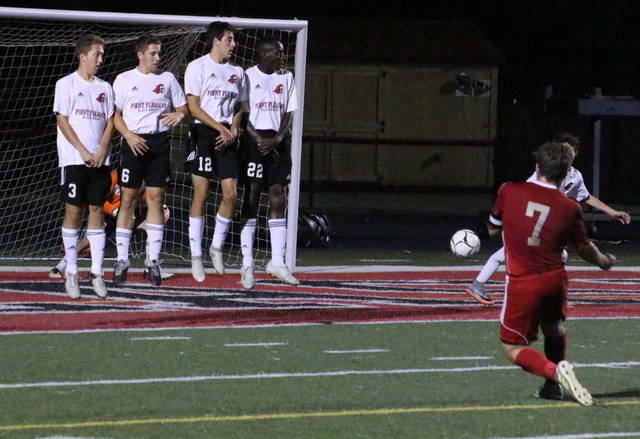 The Black Knights dodged a bullet late in the first half as keeper Zach Rediger came up with a save on a free kick with 7:45 left, which allowed the hosts to stay within two goals headed into the intermission. CMHS outshot Point by a 9-5 margin in the first half, which included a 5-2 advantage in shots on goal. The visiting Knights turned up the pressure in the second half after producing a dozen shots down the stretch, with eight of those ending up on goal. Point Pleasant, conversely, mustered only five total shots — with two on goal — over the final 40 minutes of regulation. Rediger made a huge save at the 11:45 mark following a Hogan Carter penalty kick, allowing the hosts to stay within striking range. Carter, however, had another penalty kick come his way a minute later, and the senior beat Rediger with 10:51 remaining for a three-goal advantage. Cabell Midland finished the evening with a 19-10 edge in shot attempts, including a 13-4 advantage in shots on goal. The guests were also whistled for 10 of the 16 fouls called and took three of the five corner kicks in the match. 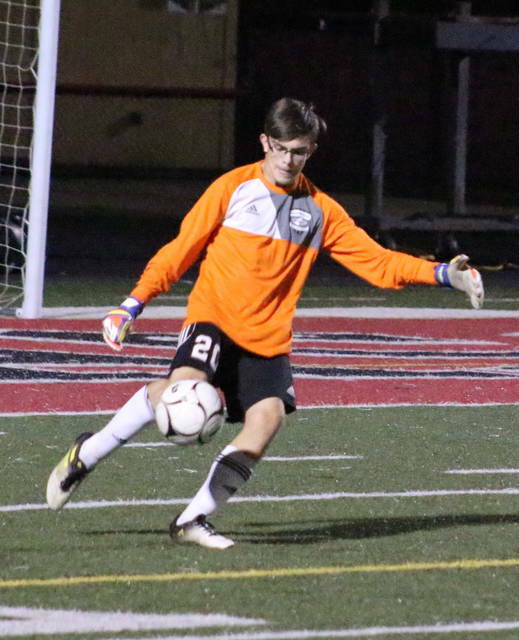 Chandler Morton recorded four saves in net for CMHS while preserving the shutout. Rediger stopped 10 shots in goal for Point Pleasant, which was also whistled for two yellow cards in the match. It wasn’t the kind of effort that PPHS coach Chip Wood was hoping for in the team’s home finale, not to mention the final tune-up before the start of the tournament next week. As Wood noted, there was no momentum to take forward from this game — leaving him wondering what to expect in the upcoming days ahead. “Honestly, we gave very little fight tonight against a team that I feel we can play with. Cabell Midland has a good program, but we should have been able to attack their keeper more than we did. We just didn’t challenge them at all tonight,” Wood said. “We played uninspired and were not checked in to the game at all. Giving up two goals in the first five minutes was an early sign of things to come, and it’s really sad that this is how we are heading into tournament play. Point Pleasant — a four seed — begins postseason play Monday when it hosts fifth-seeded Williamstown in the opening round of the Class AA-A Region IV, Section 1 tournament at 6:30 p.m.